Ward, Kevin Thomas. North Carolina Haunts. Schiffer Publishing, Ltd., 2011. By far, the most interesting thing about North Carolina Haunts is the number of original stories the author tells that don’t appear elsewhere, particularly those in the Rocky Mount area. Ward doesn’t include every known tale from around here by any stretch, but he does add to the pile with writing down the oral ghost stories about Antebellum Greek Revival mansion Stonewall and a certain local house I’ve visited many times and where I know the principles very well indeed. He also does a good job in his section on the Bentonville Battlefield, in which he discusses with compassion how both sides were ordinary men fighting for their homes and what they believed was right. Interestingly, most of the haunting at the battlefield appears to be aural. The Fayetteville and Smithfield sections also have some spooky stories of a ghostly chief of police in the Prince Charles Hotel and a bar called Orton’s, as well as some down-home hauntings. Other sections have some of the old favorites, such as the Brown Mountain Lights, the Maco Light, the Devil’s Tramping Ground, Gimghoul Castle, Piney Grove Church, the Battleship North Carolina, and (of course) Blackbeard. Ward’s special interest in the area stems from a childhood home in Rocky Mount (on Sunset Avenue) that he describes as extremely haunted in his introduction. These early stories range from ghostly footsteps to a faceless shadow at the foot of the bed to angry spirits glimpsed through the attic hatchway to a precog dream that helped prevent a fire. All of the family members saw or heard or felt a ghost at one time or another. Ward blames it on a time his sister used a Ouija board. A seance is a common folkloric origin in hauntings that begin abruptly with no apparent previous history. So, early on, we get a taste of Ward’s storytelling style, which is evocative. Ward divides the book into five geographical parts relating to the Mountains, the Piedmont area, the Coastal Plain, the Coastal Tidewater (Inner Banks), and the Outer Banks. The freshest stories come from the Piedmont and Coastal Plains sections. The latter area has definitely been neglected by Carolina ghost story collections, so Ward makes some important additions there. The illustrations, though childlike and crude, are quite eerie. I found myself stopping several times because the book was too creepy to read too late at night. That’s a compliment, by the way. Less of a compliment is that I also frequently had to stop in irritation because this book really needed a copy editor before publication, but didn’t get one. It’s rife with typos and grammatical errors, as well as awkward diction, repetitious speech, and just plain weird idioms. I’ve noticed this is a problem with Schiffer and History Press publications. You’d think the publishers would put in the effort and money for some editing and proofreading to make these books shine. 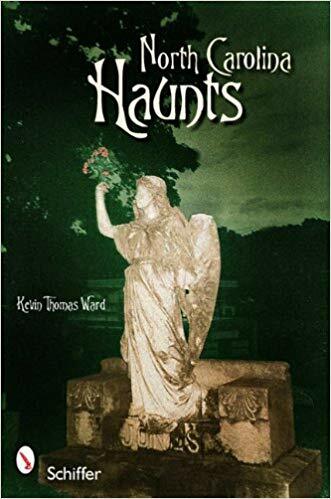 North Carolina Haunts is still worth a read, but it would have been an easier one with a good editor and proofreader on board.